Luckily for all of us and the environment, businesses of all sizes are playing their part in going green. However, small businesses still may be hesitant to initiate the necessary changes in fear of high costs and loss of productivity. The truth is showing our commitment to sustainability is not just an abstract wish of the environment protection groups. This movement has grown to such vital importance that small business CANNOT ignore it as a necessary marketing tool. Don’t consider the business benefits of green marketing the wrong reason to do the right thing. Upholding moral and social responsibility always has financial benefit because talk alone doesn’t attract customers and it certainly doesn’t keep customers. Green marketing is a business strategy. It is what a business does behind the scenes that show its market viability and ability to keep its promises. Think about it. Would you purchase the services or products of a company that says one thing but does another? A company that states its products are “green” but expends great valuable resources to produce that product such as tonnes of paper, wraps products in plastic and provides plastic water bottles at meeting with customers isn’t being honest about its intent. “Green” is no longer just a catchphrase. It is important to consumers. 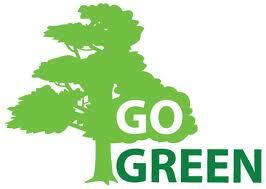 One of the best and most effective methods to go “green” is to go “electronic”. There is much more than recycling to be done by small business. Providing reusable water bottles and wrapping product in paper or, better yet, reusable bags, really are no-brainers. Actually, a strong green marketing strategy can be very accessible and inexpensive. Sharing information, which is the crux of building a good marketing plan, can be done using social media such as Twitter and Facebook, communication methods such as MailChimp and WordPress. They are easy to use, have a massive (worldwide) audience, and are free or low cost. Provide whatever you can electronically. Take advantage of online gadgets to get max use of your website (you do have one, right?). Open an online store, provide customer surveys, update your information in newsletters, advertise great deals on your Facebook landing page, and more possibilities are endless. You’ve widened your market and eliminated the use of resources from countless meetings (petrol from travel and those ever present water bottles! ), paper, printing, packaging, not to mention, your time and money. Good business practice is instilling in customers the feelings of trust and sincerity. Companies need to stand behind their products, policies, and beliefs. Want to express your company’s commitment to sustainability and protecting the environment? Let them see your employees saving time, money, and energy commuting to work and meetings. Encourage programs among staff to get them walking (also good exercise! ), “Bike to Work”, sharing rides, and work-from-home plans. It’s very easy in these days of electronic communication to save energy while still sharing ideas and being part of a team. In addition to work-from-home days, working virtually whether at home or in the office is available to almost everyone. Skype allows you to IM (instant messenger), phone with audio or video, and limited file sharing for free; Cisco WebEx and others provide free and easy web conferencing and online meeting tools, and sites like Gotomypc allow sharing of computer screens. There are many document sharing and storing sites like Dropbox for online storage and sharing of documents, files, etc. Taking advantage of user-friendly sites like these free staff and colleagues from needing to travel to business meetings, conferences, and pickups and deliveries. Search out new ways to learn and access information you need without stepping outside your office door. The Internet is a resource with a mind-boggling amount of information. If you need to know what’s going on in your marketing territory or neighborhood (or beyond) just click on Facebook. Group your errands among the office and with other locations close by and try to carpool. If you must drive, slow down, as driving fast with lots of stops and starts can heavily drain your gas tank. Keeping your car tuned up, tires properly inflated, and in good shape also helps it to use energy efficiently. Saving just a little each week really adds up. Share your green transportation experiences with your customers, and they will be confident that you do as you say, and don’t just talk the green talk; you walk, bike, web conference, and conserve it as well!